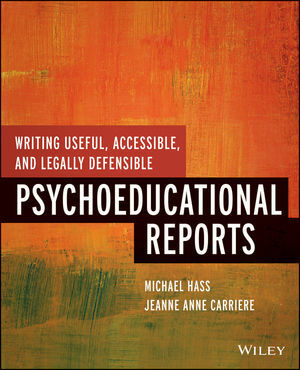 From clearly identifying reasons for referral to making recommendations based on assessment results, Writing Useful, Accessible, and Legally Defensible Psychoeducational Reports offers practical guidance for creating reports that enhance the understanding of children and their strengths and challenges in order to better meet their educational and functional needs. The authors offer step-by-step guidelines for developing an assessment plan in a collaborative process with parents, teachers, and other professionals, choosing appropriate assessment and data collection tools, gathering relevant information, and providing clear and feasible individualized recommendations that directly respond to referral concerns in a format easily understood by parents and teachers. MICHAEL R. HASS, PhD, is a Professor of Counseling and School Psychology and Coordinator of the School Psychology program at Chapman University. He has over twenty-five years of experience as a school psychologist in public schools and as a psychotherapist and educational psychologist in private practice. He is a consultant with the Los Angeles County Department of Education Greater Avenues for Independence Program for unemployed adults with learning disabilities and Faculty-In-Residence with The Center for Autism and Neurodevelopmental Disabilities. Dr. Hass has published articles in numerous professional journals and is the current editor of Contemporary School Psychology. JEANNE ANNE CARRIERE, PhD, has been a School Psychologist in a large urban school district for over 20 years. She is currently the Director of the Chapman Ability Project, a collaborative program designed to advance the expertise of educators, service providers, community members, and parents working and living with children with neurodevelopmental disorders. As a Clinical Associate Professor at Chapman University, she teaches, supervises, and mentors field-work students. She is on the editorial board of Trainers’ Forum and Contemporary School Psychology.